Counterbalanced forklifts have been a source of storage and handling systems, where they perform loading, stacking, distribution and horizontal transport functions. 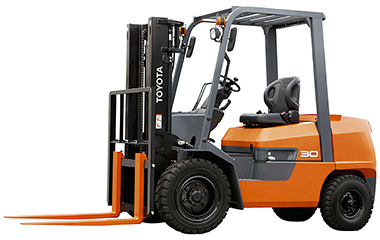 Toyota Material Handling India brings you its engine powered forklifts, which offer exceptional safety, productivity, reliability, comfort and which are environment friendly. 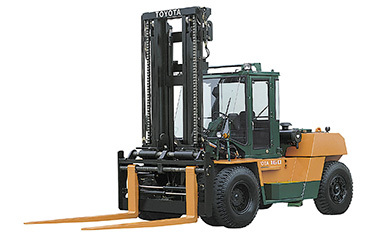 Mainly for external use, the Toyota range of diesel, liquefied petroleum gas (LPG) and gasoline (petrol) engine powered forklifts offers load capacities ranging from 1.0 to 16.0 tons. Designed for light, medium and heavy-duty material handling, our internal combustion (IC) counterbalanced trucks are equipped with the unique Toyota System of Active Stability (Toyota SAS) to enhance operator safety and comfort. Reliable Toyota Industrial engines offer faster acceleration and lift speeds, increasing productivity during stacking, loading and unloading goods, as well as horizontal transport functions. The Toyota FDZN / FGZN Series engine powered forklifts are designed mainly for external use, handling loads between 2.0 tons to 3.0 tons. The Toyota 8-Series engine counterbalanced trucks includes diesel and LPG models, with maximum load capacities up to 3.5 tonnes and lifting heights up to 7 metres. Offering a cabin for all weather conditions, and with Toyota SAS as standard, our 8-Series engine powered forklifts are ideal for outdoor use. Low noise and vibration, excellent all-round visibility and easy servicing allow for improved driver comfort and forklift truck durability. 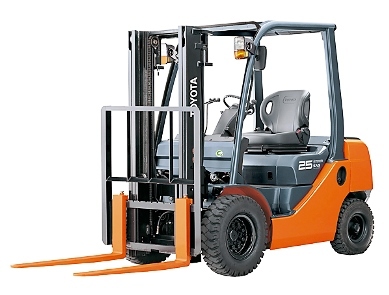 Suitable for heavy material handling operations, the Toyota 8FDN/8FGN Series counterbalanced forklifts offer lift heights of up to 6 metres and load capacities of 3.5 to 8.0 tonnes. The Toyota industrial engine ensures high lift speeds, acceleration and fuel efficiency. 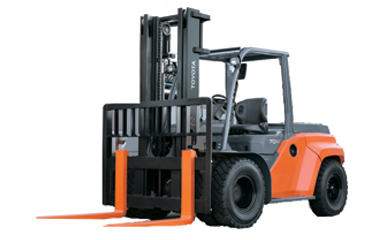 The excellent all-round visibility and Toyota SAS help to protect the forklift load and driver. These compact counterbalanced trucks have a strong and durable metal chassis, and are easy to service, making them highly reliable. 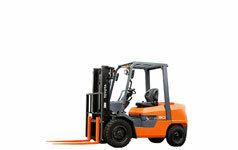 Demanding applications and punishing work environments test the true performance of a forklift. The Toyota 10-16 tonne rugged design and heavy-duty components, combined with its exceptional levels of operability, operator comfort and ease of service, help make this workhorse the model of enduring productivity. It's a powerful example of Toyota reliability and value at work.